Here in the Rip City, basketball is an exciting and popular way to stay active while learning and honing important skills like teamwork, sportsmanship, and how to participate in healthy competition. If you are interested in outdoor basketball court construction in Portland, OR, Hal’s Construction has the experience and knowledge to deliver an exciting and secure space for you to play and enjoy. Our outdoor basketball court systems are designed and engineered to be safe, and customizable depending on your particular needs. Hal’s Construction is seasoned in outdoor basketball construction for both residential and commercial purposes in the greater Portland, OR area including Beaverton, Tualatin, and Gresham. Excavating for the basketball playing court and surrounding area will include several important steps. We must make sure the court is constructed on a firm foundation with a flawless drainage plan. The area around your basketball court is very important too. Aspects you might consider are: Spectator seating, lighting, electrical outlets, parking lot, walkways and fencing. If you plan on having night lighting and water available at your basketball court, we will make sure all trenches are expertly excavated and the utility is properly installed. Walkways, curbing and parking lot paving is one of Hal’s Construction’s greatest attributes. Give us a call so we can talk about how you would want your dream basketball courts constructed. Our expert design team can draw up plans to make sure every detail of your basketball court and surrounding amenities will offer you and your players an excellent experience. All outdoor basketball court systems can have a durable and shock absorbent surface installed to help your players deliver their best game day performances. Our state of the art technology allows us to provide you a superior quality court using the best materials on the market that is sure to deliver an authentic basketball game experience for all. Hal’s Construction can create a basketball court surface that is colored. This is typically a difficult product to install unless you have experience working with this material. Textured court paints are unique and gives your court a professional look. You should only use a professional basketball court contractor to repair cracks in your court surface and to level out any low spots in the courts surface or the concrete substrate. Special preparation and cleaning is a must. 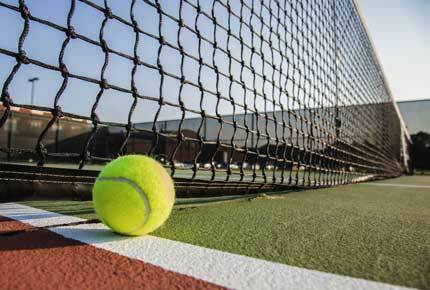 After the colored coating is applied to your courts surface the game markings need to be expertly painted. Basketball courts can have different markings depending on if you are wanting to play with High School, NBA or college markings. Hal’s Construction can stripe your court with any diagram layout you wish. Recreational basketball courts typically use the High School diagram and is what most people commonly pay on. Call Hal’s construction for a free estimate on excavating, installing, surfacing or restriping your basketball court. Hal’s Construction will be happy take a look at your project location and give you a written estimate. 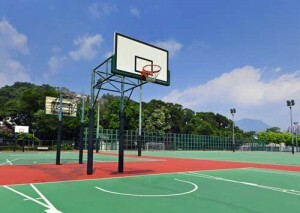 At Hal’s Construction, we are confident that with our strong outdoor basketball court system design and installation experience along with our stellar customer service and competent project management skills, you will be highly satisfied with the final product. For a “Nothing-But-Net Experience”, call now for more information or to schedule an appointment for a Free Estimate.